Two-way star Shohei Ohtani of Los Angeles Angels was a singular sensation in voting for American League rookie of the year, while Atlanta's Ronald Acuna Jr. was a runaway pick for the National League honour over fellow outfielder Juan Soto. Two-way star Shohei Ohtani was a singular sensation in voting for American League rookie of the year. 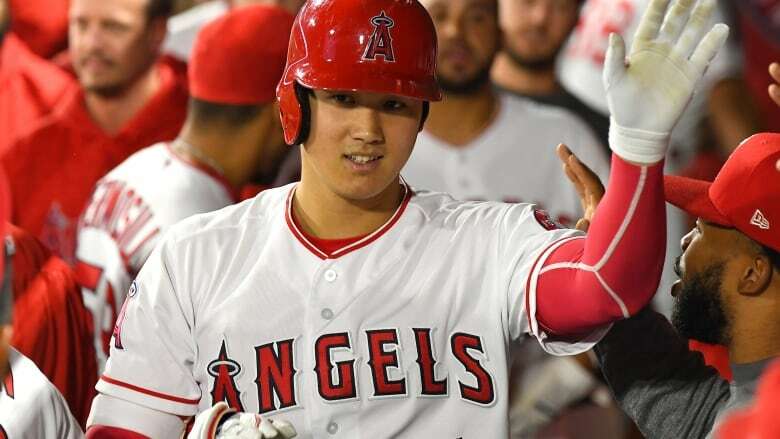 A standout on the mound and at the plate for the Los Angeles Angels, Ohtani was an overwhelming pick for American League Rookie of the Year after becoming the first player since Babe Ruth a century ago with 10 homers and four pitching wins in the same season. Atlanta Braves outfielder Ronald Acuna Jr. was a runaway pick for the NL honour over Washington outfielder Juan Soto in a contest between 20-year-olds. A 24-year-old right-hander who joined the Angels last winter after five seasons with Japan's Nippon Ham Fighters, Ohtani received 25 first-place votes and four seconds for 137 points from the Baseball Writers' Association of America in balloting announced Monday. Ohtani was 4-2 with a 3.31 ERA and 63 strikeouts over 51 and-two-third innings in 10 starts, limited by a torn elbow ligament that required surgery on Oct. 1 and likely will prevent him from pitching next year. As a designated hitter, he batted .285 with 22 homers and 61 RBIs and a .925 OPS in 367 plate appearances. He became the first player with 15 homers as a batter and 50 strikeouts as a pitcher in the same season. Ohtani is the first Japanese player to win the honour since Seattle's Ichiro Suzuki in 2001 and the fourth overall. Andujar hit .297 with 27 homers and 92 RBIs in 149 games. The 23-year-old third baseman set a Yankees rookie record with 47 doubles, three more than Joe DiMaggio in 1936, and tied the AL rookie mark for doubles set by Boston's Fred Lynn in 1975. Torres, 21, began the season at Triple-A after missing the second half of 2017 with a torn ligament in his non-throwing arm. The second baseman made his big league debut April 22 and hit .271 with 24 homers and 77 RBIs. Acuna, in Japan with a major league All-Star team, declined to do a morning conference call on the results, BBWAA secretary-treasurer Jack O'Connell said. Acuna started the season at Triple-A and made his debut on April 25, the youngest player in the majors then at 20 years, 128 days. The Venezuelan hit .293 with 26 homers, 64 RBIs and 16 steals with a .917 OPS. He set a Braves record with eight leadoff homers this season and tied a franchise mark by homering in five straight games from Aug. 11-14. Soto debuted on May 20 at 19 years, 207 days, although in a quirk the Dominican is credited with a home run from five days before his debut — he went deep on June 18 against the New York Yankees in the completion of the May 15 suspended game. Soto hit .292 with 22 homers, 70 RBIs and a .923 OPS. He was two shy of Tony Conigliaro's big league record for home runs by a teenager. Buehler, a 23-year-old right-hander, was 8-5 with a 2.62 ERA in 23 starts and one relief appearance. The AL and NL Manager of the Year will be announced Tuesday. Boston's Alex Cora, Tampa Bay's Kevin Cash and Oakland's Bob Melvin are the finalists for the AL honour and Atlanta's Brian Snitker, Milwaukee's Craig Counsell and Colorado's Bud Black are the finalists for the NL award.